Solar panels allow you to free convert sunlight into usable power in your home. The energy you get in this way is clean energy. You can use it when you like and how much you need and it still won’t have a negative impact on the environment. This is not like the energy we normally use. Energy we normally use comes from the power plants and it produces carbon dioxide emissions. Not only that is it polluting our air but it is also causing global warming. Negative impacts on environment that are evident from the use of energy in our world have led to a significant need for the use of clean and renewable energy sources. Renewable energy sources offer us the opportunity to reduce our impact on the environment. Although the devices used to produce energy from renewable sources pollute the environment in the process of their production that is significantly offset by their subsequent role in achieving sustainability. One of the most important renewable energy sources is the sun. Not only the sun has been warming our little planet for millions of years, but it will continue to do so for millions of years to come. Solar energy is a much better choice than the use of fossil fuels, as it not only has a much lower impact on the environment but it also comes from an inexhaustible source. Meanwhile, all known fossil fuel reserves could be totally spent within the next 100 years. In the 2013 the near-total worldwide energy consumption was 500 exajoules and the total solar energy absorbed by the Earth’s atmosphere each year is 3.9 million exajoules. That means that we only need 40 minutes of sunlight to fulfil our demands for a whole year. 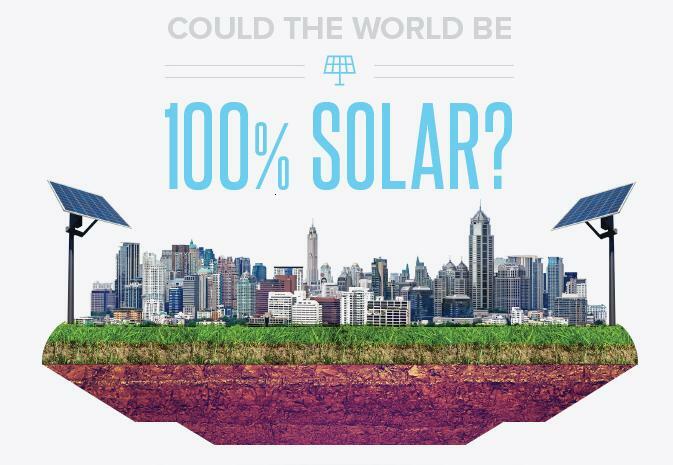 Find out could the world be 100 % solar in this amazing infographic.